Stand Up Paddle Surfing: Hot Off the Press: Events and Something New! 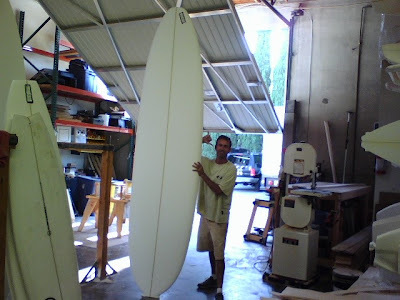 I'm pledged to secrecy on this one but I will give you this: You'll soon be seeing a lot of these 10'ers in the water! I'll pass along more info on these when I can- believe me once you know the mastermind behind this shape you'll want one- the guy is major. In case you missed it, there are two events you need to be aware of, especially if you live in San Diego. September 22, The International Waterman will host it's 1st annual Paddlesurf Event, follow the link for more information. There will be some boards available to test ride and evidently there are prizes too! It seems to be a low key event, with bring your own beverages and bbq items, the entry fee is fifteen bucks which gets you an event t-shirt as well as a water bottle. October 7th, WildCoast will be running its 4th Annual Dempsey Holder Ocean Festival check the sidebar to your right for Dempsey Contest Info. This year we convinced Serge Dedina that there'd be enough interest in paddlesurfing to run a heat. Let's show up in full force to support all the good work that WildCoast does for us surfers, notably protecting all those lonely Baja point breaks we love so much. Each event costs $25. John - where can I find info on the Dempsey Holder contest? How much to enter, forms. time, etc?? Hey- It took a little searching but I found the online registration site- go to www.wildcoast.net and check the side bar to your right click on the Dempsey Contest Info and then follow the link to the contest registration. It costs 25$ per event. I'll also post the registration info on the blog. I just found that - thanks. Any idea what time you need to be there? I'm not sure- I'll chase that down and see what's going on- check back. John, does the mastermind behind the 10 footers mentioned in this blog happen to shape under the label with three hexagons on it? Just wondering? How's the new board? Pick it up yet? I can neither confirm nor deny that allegation! Picked up the new board- I'm going to post a full update on it soon... I've been on it three times- I'm digging it- working out fin placement and sizing- she's a sensitive little ("little" used figuratively, she's got a gut on her) beast- wait 'til you see the spray, Stamps calls her the Mahi. I'll have her at the Shores this weekend, I'm going to paddle her to Blacks with Pollard et al. Are you going? I ran into Dave Craig last night down here at the beach- I hear he's got a few 10' and change boards in the works- maybe yours? Bro, you should have stayed out longer last night. Going out tonight? Sharpen the saw bro!! That SK board felt so sweet. I can't beleive how well it floated me. How did it paddle? Hey Homey! That was thumpy out there wasn't it- but fun. Sharpening in progress! The SK was pretty darn fun, paddled very well. Did you see those two bombs I got on the Stamps- things got speed! There will be a solid assortment of SUPs at the SACRED CRAFT Consumer Surfboard EXPO. I'm planning on checking out that event- sounds super cool!